American Chemical Industry blocks Senate Amendment to S. 510 to ban BPA. The Food Safety and Modernization Act (S. 510) has caused a lot of controversy. The good news is that the Tester-Hagan Amendment (if approved) would address some of those concerns, like exempt some “farms that direct market a majority of the product to consumers to clarify that this includes sales made at farmers markets, community supported agriculture drop-off sites, roadside stands and other similar direct market venues”. Although this amendment is being voted on currently, another positive amendment to S. 510, proposed by [amazon_link id=”061326178X” target=”_blank” ]Senator Feinstein[/amazon_link], has already been shut down by the American Chemical Industry’s powerful lobby. 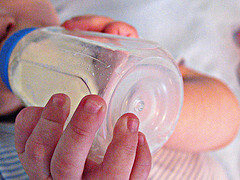 Today the U.S. Senate failed to consider a ban on the toxic chemical bisphenol A, or BPA, in baby bottles and infant feeding cups. Senator Dianne Feinstein, D- Calif., planned to offer the ban as an amendment to the Food Safety Modernization Act. As recently as yesterday, there was enormous support for the amendment from both sides of the aisle, but intense lobbying at the 11th hour by the American Chemistry Council blocked its introduction. Such action by a the chemical lobby screams to me about what is wrong with our “democracy”. The very companies responsible for poisoning our children (and adults) with a known endocrine-disruptor should not have the power to block legislation that would protect us from heart disease, breast cancer, erectile dysfunction, diabetes, etc. “It’s a sad day when the chemical industry muscles out children’s health and safety,” said Janet Nudelman, policy director at the Breast Cancer Fund, which led a national coalition that advocated for the ban. “Once again we see the American Chemistry Council prioritize the profits of chemical companies over the public’s health. It is not fair that our nation’s children are on the losing side of this equation.”.. It is good Feinstein will not give up, but at the same time, [amazon_link id=”B001NDH4HK” target=”_blank” ]BPA[/amazon_link] is hidden in so many products, it is hard for consumers to truly avoid it. The most recent discovery was BPA in cash register receipts, and I am pleased to see our local organic food co-op has switched to BPA-free receipts (although the cashier claims they are going through more paper now). Something needs to change in our system. We can’t let our health laws continue to be swayed by corporate profits. It’s beyond not fair. Ahoy Matey! Wooden Pirate Ship Fun!